We offer thorough and professional flat cleaning at reasonable prices which is available every day of the week. If you need help in your cleaning work and need someone to take care of the rooms in your flat, call us. We will send our cleaners to your address and they will provide the work which needs to be done. Our company is located in SW11 and offers low-cost flat cleaning services implemented by professionally-trained cleaners. They will apply the most suitable cleaning procedures which will make your rooms hygienic and looking great. Our staff will implement the professional flat cleaning which the customer needs. They will come to inspect the rooms and choose the most appropriate machines, detergents and the time which they will need. Our cleaners will apply non-toxic cleaning product over the windows to remove the dust, stains and soiling from them. They will vacuum clean all rooms and areas using advanced machines. Our employees will dust all pieces of furniture, areas and electrical appliances with cleaning solutions and microfibre cloths. Use their professional help to keep your property in a healthy condition. 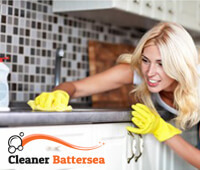 The flat cleaning which we provide is at your disposal in and near Battersea from Monday to Sunday. We can sanitize your flat one off or come as often as you need our help to do the necessary cleaning chores. Our staff will scrub the inside and outside surfaces of the oven, washing machine, dishwasher and the rest of the kitchen appliances. They will disinfect the bathroom and toilet, remove the lime-scale from the tiles, scrub the extractor fans and light fittings. You can order the flat cleaning which we provide in SW11 Battersea over the phone, by e-mail, use our online chat or booking form.